The Student Learning Outcomes (100 pts. in 2010) were combined with the Process Effectiveness Outcomes (70 pts. in 2010) and the Strategy Effectiveness Outcomes (~15 pts. in 2010) but their total of 185 pts. was reduced 65 pts. to 120 pts. None of the Criteria questions changed significantly from 2010 but the number of points was reduced over 35%. 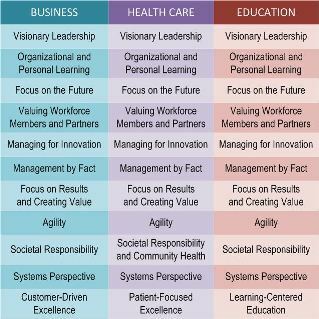 Does this mean that Baldrige has learned that the validated edge of good management practice now decrees that product, process, and strategy effectiveness results are decidedly less important to improving competitiveness?